The Grammys celebrate the year in music by recognizing artists’ achievements, giving us epic performances, and reminding us all how music brings us together! Check out the BIGGEST highlights from the red carpet to the show below. Miley has been on FIRE recently serving major looks and she did not disappoint last night! Her oversized suit paired with a full ear of diamonds was an edgy, yet classic statement. Oh and did you see her AMAAAZZING shoes? Shop your own bold pantsuit here. After taking to social media to state that designers were refusing to dress her because she was “too big,” several reached out including none other than the Father of fashion Karl Lagerfeld. She ended up going with this showstopping Monsoori design, which happened to be my personal favorite of the night! Shop here for your own Bebe Rexha inspired look. Heidi always knows how to dress well being that she is a veteran model, so I expected nothing less than perfection. This crisp white couture mini dress is reminiscent of her days walking the Victoria’s Secret runway in angel wings and her silver accessories complete the look! Shop here for your own diamonds! Camilla reminded us all of her beauty in this fuschia color that is flawless with her dark features and a fit that clearly emphasizes her best assets! While I think she could have taken more of a risk, overall, she is one of the best dressed of the night! Shop your own version here! The ‘This is America’ singer won four awards for the major hit including Song and Record of the Year. The first-time nominee, 21-year-old breakout star won Best R&B Album for her self-titled EP. The ‘Electicity’ singer received two awards, the biggest being Best New Artist. The outspoken rapper made history as the first female solo artist to win Best Rap Album. The Opening Performance - Camilla Cabello made history as the first ever Latina woman to open the show. What a well deserved honor! The stage production and dancing reminiscent of ‘West Side Story’ truly took us all to ‘Havana’ for a moment, the title of the song she sang. Oh, and Ricky Martin joined her and all I can say is, THANK YOU! Surprise appearance by Michelle Obama - To kick off the show after Camillia’s performance, Alicia Keys brought out her “sisters” Lady Gaga, Jada Pinkett Smith, Jennifer Lopez, and none other than MICHELLE OBAMA to discuss what music means to each of them. In her fabulous sequins suit, Michelle spoke with her characteristic confidence and poise and received an immediate standing ovation. 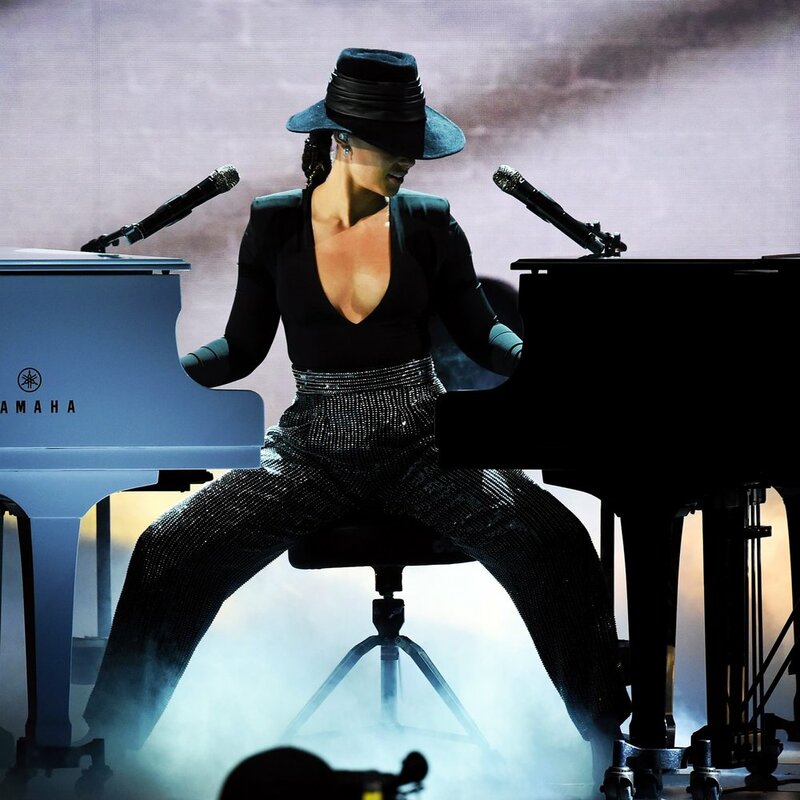 Alicia Key’s piano solo - Alicia Keys served as this year’s host, but had an absolutely incredible un-offical performance. She took to the stage and amazed everyone by playing two different pianos simultaneously while belting out “songs she wishes she wrote” in her soulful and mesmerizing voice. No wonder she has 15 Grammys! 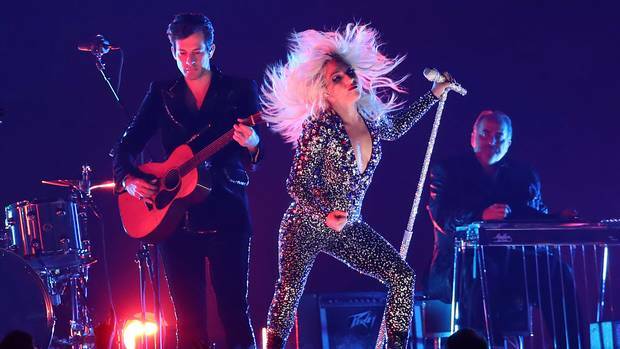 Lady Gaga singing Shallow - The pop star took to the stage to perform the song she wrote for the hit movie ‘A Star is Born,’ of which she starred. Mixed reviews followed her performance of the deeply emotional ballad due to her wild rock-like performance, but all-in-all she sounded impeccable and the song won two awards of the night. Diana Ross wishing herself a Happy Birthday - While she doesn’t turn 75 until next month, The Recording Academy wanted to celebrate the QUEEN she is, so Diana gave us a magical performance. Taking the stage in a big red dress almost as bold and beautiful as her personality, she showed us all how to embrace age gracefully with fun and energy… and don’t even get me started on her sweet 9 year old grandson’s introduction speech. Jlo’s Motown Tribute - While it sparked some controversy, the performance was quite a show. From her sparkling outfits, incredible dancing, and flashy production, Jennifer Lopez ensured to entertain. With help from Smokey Robinson, the founder and frontman of the vocal group the Miracles, and Neyo, we were all brought to Motown. Aretha Franklin Honored - Following an "In Memoriam" segment to remember all the artists lost this past year, Yolanda Adams, Fantasia and Andra Day gave a stunning rendition of “Natural Woman” in celebration of Aretha Franklin’s life and career. What were some of your highlights of the night?